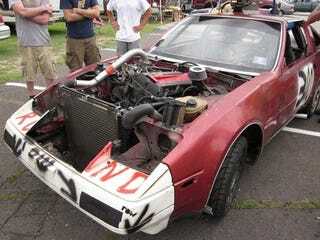 Nearly The Engine Swap Of The Day: Saab Turbo B Into Nissan 300ZX! Dropping an L28ET yanked from a Datsun 280ZX Turbo into a third-gen Firebird and racing the result was a good idea, which makes today's swap a great idea! Yes, Team Rust In The Wind has taken a 300ZX and transplanted a turbocharged Saab B engine into it, using some sort of homemade transmission adapter plate. Does it work? Sure! The car looks and sounds great on the track. Unfortunately, this fine Swedish-Japanese machine spent more time in the Penalty Box than on the track Saturday.